This years Consumer Electronics Show is happening in Las Vegas on Jan. 7 – 10. 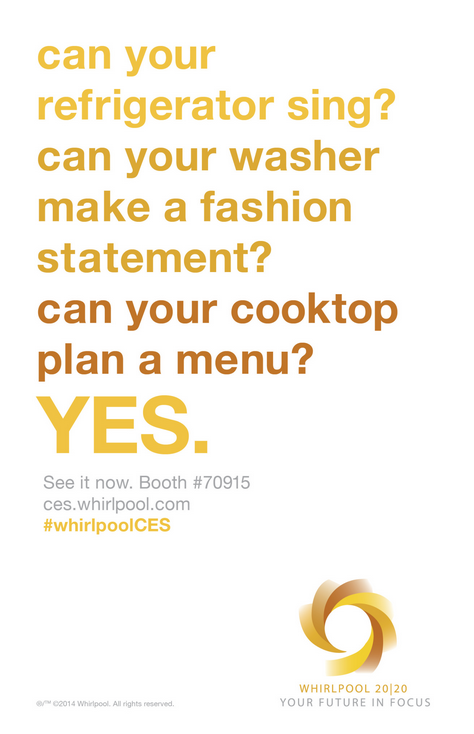 CES is where brands bring their latest and greatest to debut and this year Whirlpool is revealing four amazing new products. I got a small sneak peek and am excited to share a little info with you! 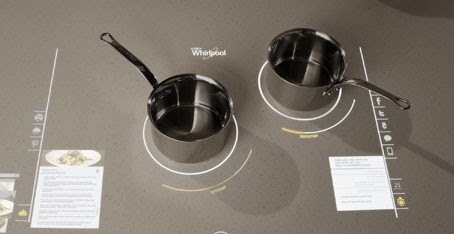 The product I am most excited about is the Interactive Cooktop concept. I am always looking up recipes on my phone or iPad while I am cooking and am always worried I will ruin my gadgets having them in the kitchen. Whirlpool takes away that worry by putting the gadgets in the kitchen for you! The interactive cooktop has a cook anywhere surface that also serves as the kitchen island, so you can go from helping with homework to cooking dinner all in one place. Surfing the web for that report your son is writing and the recipe you wanted to try from Pinterest. Whirlpool continues their innovation with the CoolVox Refrigerator. If you are a family that loves dancing in the kitchen, you will love the sound system refrigerator concept. You can stream music and podcasts through your Bluetooth® enabled devices through Harman Kardon Speakers in your refrigerator!! If you aren't the dancing type, you can listen to your favorite instructional cooking podcasts that way too!! If the aesthetics of your kitchen is on the top of your list, you will love the focus Whirlpool is placing on customizing everyday appliances with your personal style. At CES they are debuting the MaxArt Microwaves. 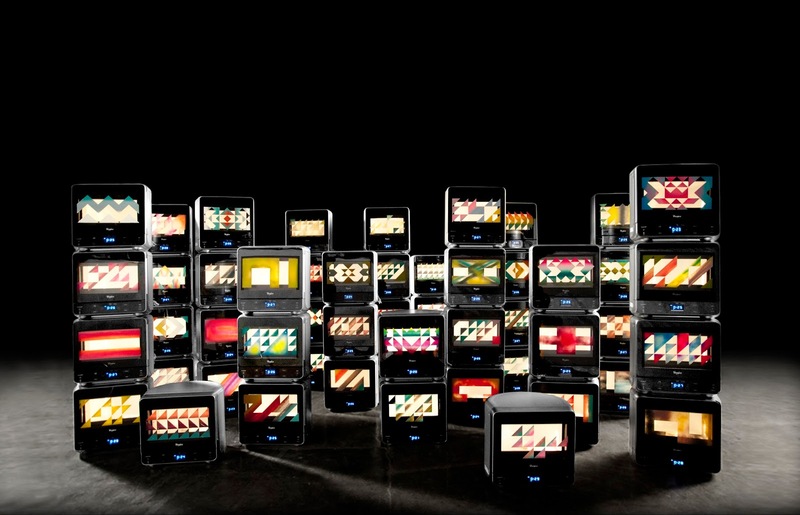 Whirlpool® brand collaborated with two artists in Mexico to turn a daily-used appliance, the microwave, into a work of art. If it is your laundry room that needs a centerpiece, Whirlpool has you covered there too! The new Duet® Designer Series offers a collection of bold and beautiful designs for your laundry pair. You get all of the technology of the Duet® Washer and Dryer in a prettier package! 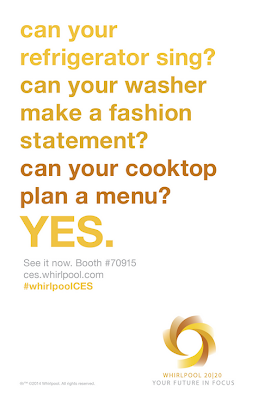 If you want to know more about the newest products from Whirlpool®, they will be providing ongoing updates from the CES show floor at their digital hub:http://ces.whirlpool.com. Since Whirlpool 20/20 is all about a future focused on you, we, want to hear your ideas for it. Tell us your idea for the future for your home and be entered to win a $1,000 grand prize. We're midway through finishing our basement. We pay cash for everything so we're waiting until we have enough money to do the drywall and flooring. It's a big space (over 900 sq ft) so it's a costly proposition. We have great thoughts about using that space for our family: kids' sleepovers, movie nights, a play area for our youngest, a pool table for Daddy and his friends, and some extra storage in the back for games/toys. Our goal is to finish it by year's end. My future kitchen would definitely be an open floor plan and plenty of space for when I have family and friends over. I would also love to have a organized pantry with a place for everything. My stove top is in need of replacement. Three of the knobs no longer work and part of the grate is broken. The interactive cook top looks amazing. It would be amazing to have that installed in my kitchen. I think for the future, it would be great to have my on line recipe right at my finger tips in an easily accessed area. Maybe a screen right on my refrigerator since for me, that is right in the middle of my cooking area. Right now I use my iPhone and have to constantly keep pushing the home button when it goes black while I stir, or boil, etc. We recently moved into our new home and I have so many ideas for it including knocked down a wall between the kitchen and dining room, removing the current center island and replacing it with something more function, replacing the microwave and obtaining a larger freezer! My idea of my future home would be very automation. Such as the washer and dryer doing laundry and folding clothes for me, a stove top that helps me cook easier, and a fridge that can tell me what I need while I'm in the market. :) Am I asking for too much? I would love a completed bathroom off the master room. I live in a condo and my husband has been in the middle of completing finishing the bathroom for about a year now. I would also love new carpeting on the main room floor and then a dishwasher too. My plan for the future of our home is to upgrade our appliances and home systems as often as possible as we can afford in order to take advantage of new technology and efficiency. I would love to have machines that would do all the work. My future kitchen would be 3 times bigger with a ton of counter space and nice appliances! I'd love a computer screen in my kitchen, right above the counters. This would be great for reviewing recipes for when I'm cooking. $1000 would go a long way right now. my future home would have solar panels and a whole house fan. I also would like to start a compost pile and a garden that I would water with rain water stored from the winter .Also new smart appliances of course and a kitchen remodel . I want a double oven. So useful for the holidays! I would like to have a stove with a touch pad. I would love to have microsuede sectional sofa, a fireplace, a kitchen island, granite countertops, all new GE kitchen appliances including a double oven and a loft! Awesome! A stove with a touch pad! We are thinking of going solar. I would like to see appliances that have mini generators or battery backup so they work when the power goes out. I want to see more energy efficient appliances in the future for my home and ones that can clean themselves. I love my home-it has an open floor plan, and a loft overlooking the living room, and a sunken living room-but I would love to update all my appliances-mine work great but are almost 20 years old-i love the idea of interactive appliances! I would Love a fridge that remembered expiration dates of perishables and alerted you when you need to replace things and a kitchen with a backup generator that kicked in automatically when power was lost. We really need new appliances. Our refrigerator is on its last leg and we need a new stove, our oven is not working. I would love some new modern energy efficient appliances. My clothes dryer will no longer shred my towels. I would like my future appliances to run efficiently and have more power. For the future of my home, I would love to refit my kitchen and laundry room with energy efficient appliances. It's a little sad, but for the future of my home I'd like an air conditioning system. SoCal summers are getting unbearable without it! for the future of my home, I'd really like a refrigerator with more room! I’d love to have talking cookbooks that you can give oral commands to, like “wait” (while you measure an ingredient). Thanks for the giveaway! I would like bigger rooms so I could have more storage space. My future kitchen would be larger with energy efficient appliances. To me, the amazing appliance is just a way to facilitate a happy family, and a great place to hang our family’s mantra: No other success can compensate for failure in the home. My future home needs a much quieter ice maker. Our fridge doesn't have a hook-up, so we have a free standing ice maker that rattles. A quieter one would make for much more pleasant entertaining and a quieter daily life! Ready for a new fridge here. Counter space and more efficient storage in the kitchen! I would love appliances that knew to shut off before the food burned. I burn way too much toast! A double oven would be nice. I just want a giant kitchen with a double oven! I'd love to move to a new house someday -- or an old one that's been totally redone. I love bright open rooms with hardwood floors and energy efficient appliances. I would love a coffeemaker that could sense when I woke and brew at that exact moment! I'd love a slow cooker that worked with me. I am a full time, working mom, so a slow cooker is a great tool. But even the ones with the timers, can leave my food a bit dried out by the time I get home. I'd love one that would start cooking with enough time to be done by the time I get home, not just on warm, like the one I currently have. I'd love a house with fewer walls so we can spend more time together. I would love to have innovative appliances that are more suitable for people like me who have trouble standing for long periods of time. My refrigerator doesn't sing, but it odes make noises reminiscent of the tontons of planet Hoth (Star Wars reference, if you're perplexed). I suspect the noise isn't a good thing. Future plans, all new appliances from Whirlpool! What a dream!!!! I would like a appliance that sorts the laundry for me. My dream future kitchen would have a replicator like on Star Trek so I would never have to cook. My dream appliance would be one where things would get done quicker. I would love to just throw my laundry in a bin and have the washer sort through the clothes, fill the washer and when it was done dry them. That way I'd only have to put the clothes in or out. Or maybe they could work on making a Rosie Robot like on the Jetsons. That would be perfect. I would love a fridge system that could rotate products and keep track of when something like your milk is past the due date. My dream: a kitchen that would clean up after my husband! I could really use a new fridge!!! Whirlpool has some amazing new products!! I would love a itemize fridge to put in dates of items and see what is past their date of expiration. the future of my home is prolly falling to the ground.it is rotten in the floors and the ceiling leaking.i would like to build a home but cant afford to right now.but i hope to seal the roof and paint and fix the floor.i am greatful we have a warm place to lay our head and call home. A finished basement would be nice. I would love to have solar panels and energy saving appliances! In the future our home should have a robot that folds the laundry. All of my appliances would be more energy efficient and all would have a touchscreen interface along with being able to be controlled from an app on my phone. I hope to be able to afford to get an on-demand hot water heater to help save natural resources in the future! I would love to someday have all energy efficient appliances and all matching appliances!! I also want my fridge to order food for me !! I’d love a single appliance that is both a washer and dryer – toss in the clothes, come back and they are washed and dried. A space saver and a time saver. I would love self-cleaning appliances. Would love to have all self cleaning appliances. I would like to have an oven that has a door that is a flat screen TV. I would love to have a Microwave that has a little recipe finder on it! That would be great! When we are lucky enough to get our own home I just want it to be cozy. I want it to be comfortable for my girls and their friends. Thank you! I would love a self cleaning home. I’d love to have more energy efficient appliances. I'd like to have an appliance that could tell me when a part is starting to fail and ones that are easier to keep clean. A freezer and refrigerator that would keep a running inventory of what I have stored would be very convenient. Ranges would be able to turn off and on automatically. Flooring materials would be able to absorb dirt. my kitchen for the future would be applicance that clean themselves and work for 20 years with no break downs. lots of room in the kitcehen.